February is full of events of different genres for Indians in and around Dallas, TX though it is the shortest month of the year. We at Indian Eagle filtered all Dallas Indian events in February 2018 based on our readers’ preferences and handpicked seven best events, including DFW South Asian Film Festival. Our list of events for Dallas Indians in February will surely cater to your various tastes of entertainment. 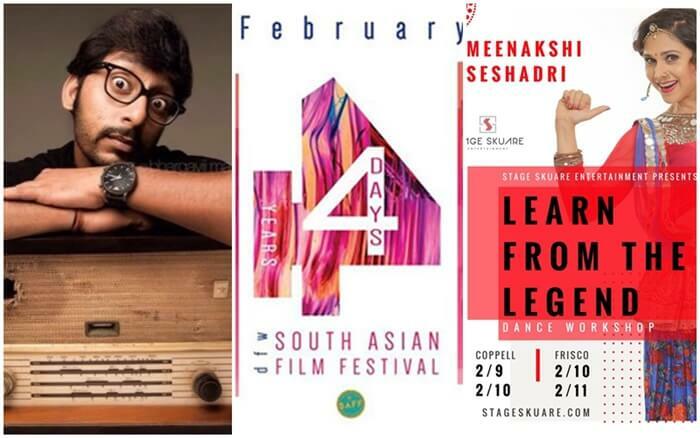 4th DFW South Asian Film Festival tops our list of Dallas Indian events in February 2018. A 4-day annual celebration of South Asian short films, features and documentaries, DFW South Asian Film Festival premieres a wide range of films dealing with issues in various walks of life from South Asian countries including India. The DFW SAFF 2018 has a great lineup of films that South Asian communities living in the United States would be able to connect with. Click Here for timing and venue details. There is nothing as good as yoga to start a new month with good health and fitness. Dallas Indians will welcome February with a two-day yoga event in Lewisville. One of the top Indian events in Dallas Metropolitan Area in February 2018, Yoga Immersion on February 3 and 4 in Lewisville will be a crash course under the guidance of veteran yoga and meditation teacher Yogacharya Krishan Verma, who will introduce participants to various yoga postures, breathing techniques, meditation practices and health benefits of Ayurveda. Interactive discussions, guided meditation and self-healing exercises will help your mind and body unwind. Don’t miss Renowned Bollywood actress and classical Indian danseuse Meenakshi Seshadri’s dance workshop in Coppell in Dallas-Fort Worth Metropolitan Area. To be held on February 9, the dance workshop is undoubtedly among the best Dallas Indian events in February 2018. It is being anticipated as the biggest dance workshop in Dallas Metro since Meenakshi Seshadri herself will be present there and interact with participants. Certificates will be awarded to the participants on completion of the course. There is hardly any month without a Bollywood event on the calendar of Dallas Texas Indian events. Naturally, our list of events for Indians in and around Dallas, TX includes International Holiday Soiree Bollywood Valentine’s Dance Party on February 10. The Bollywood dance party will be complemented by live music, appetizing food and other entertaining activities such as fashion show and DJ night. Why not add it to your list of Dallas Indian events in February 2018. Click Here for timing and ticketing details. Nonprofit VT Seva’s Tarangini 2018 is a good opportunity for Dallas Indians to give back to the community and society at large. One of the upcoming February 2018 events for Indians in Dallas Metropolitan Area, the fund-raising gala in Irving on February 10 will be a mélange of enthralling music, lively dance and several other cultural activities. The evening will culminate in a scrumptious dinner featuring Indian food. All proceedings from the event will go towards education of underprivileged and visually-challenged children in India. Acclaimed Indian comedian RJ Balaji is about to amuse Indians in and around Dallas with his joviality in the show “Ice House to White House” on February 10 in Coppell. Among the most-awaited Dallas Indian community events in February 2018, the live comedy show is a satirical awards show on politics, cinema and social issues. It will be a comical respite from the monotony of daily life as the show has several funny acts on in the schedule. Actor and comedian RJ Balaji from Chennai will surely crack up the audience with his funny one-liners and sarcastic puns. Indian music lovers in Dallas Metro Area are in for a melodious treat in February as the 2018 Music Café show will be held in Allen on February 24. A band of Dallas-based Hindi music enthusiasts is all set to take the audience on rides of evergreen melodies from Bollywood movies at the concert. The lineup of live instrumental music pieces, soulful songs and mesmerizing dance performances makes it a great addition to your schedule of Dallas Indian events in February 2018.